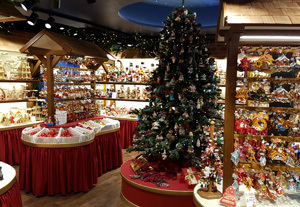 Well-known for its medieval charm and Bavarian grace, the beautiful town of Rothenburg ob der Tauber is the home of Käthe Wohlfahrt's signature store, the Käthe Wohlfahrt Christmas Village. Nestled in south central Germany, Rothenburg ob der Tauber sits on a picturesque plateau overlooking the winding Tauber River. 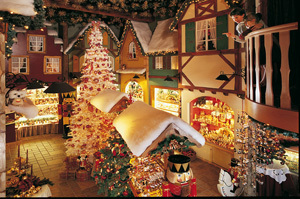 Tourists from across the globe flock to Rothenburg to stroll its cobblestone streets and admire its timbered buildings. 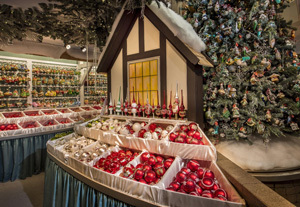 Visitors enjoy Christmas year-round in the Käthe Wohlfahrt Christmas Village, and delight in the German treasures found at the Käthe Wohlfahrt specialty shops scattered across the town. 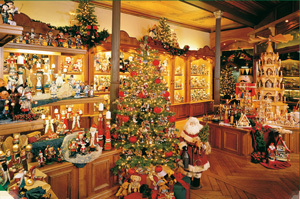 The Rose Pavillon opened, in 1990, in Rothenburg ob der Tauber. Enchanting wall paintings and beautiful merchandise greet each visitor. 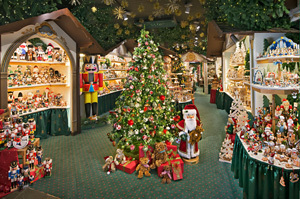 It offers charming home accessories and scented gift items in all price categories in an expertly decorated setting. 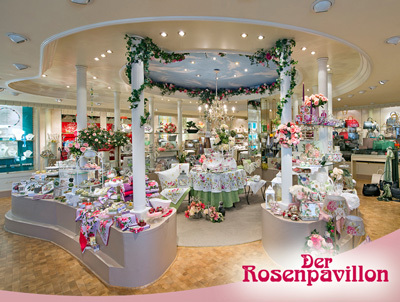 The Rose Pavillon also offers a fine selection of exclusive brand name items like Meissen Porcelain, BREE leather goods, MCM, Goldpfeil, Zwilling, Port Meirion and many others. 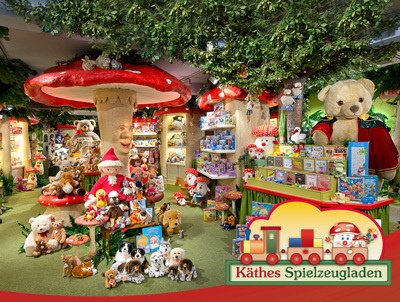 On May 22nd, 2014 the newest Rothenburg ob der Tauber store was opened; Käthes Spielzeugladen. 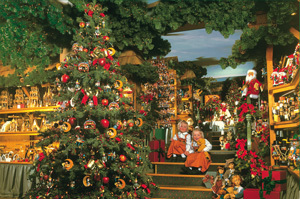 The Toy Shop of Käthe Wohlfahrt is a great experience for the entire family. 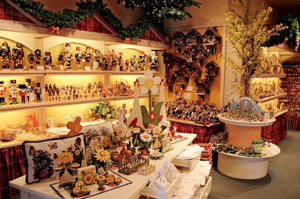 German games, toys and jig-saw puzzles are presented in the enchanting atmosphere, as well as dolls, teddy bears and many other things that brighten the faces of children and parents. Bamberg is a city in Bavaria Germany, located in Upper Franconia on the river Regnitz close to its confluence with the river Main. Its historic city center is listed in UNESCO (United Nations Educational, Scientific and Cultural Organization) World Heritage Site. 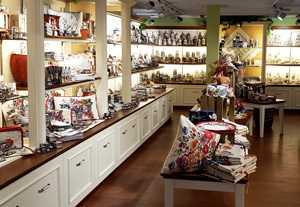 The Käthe Wohlfahrt Store is located next to the old city hall on Karolinenstrasse 3-5. Berlin is the capital city of Germany and one of the 16 states of Germany. With a population of 3.5 million people, Berlin is Germany's largest city. One of the most well-known landmarks of Berlin and Germany, The Brandenburg Gate, is a former city gate rebuilt in the late 18th century as a neoclassical triumphal arch. 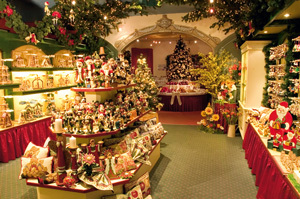 The Käthe Wohlfahrt Store is located on the Kurfurstendamm 225/226 opposite the famous Cafe Kranzler. Heidelberg, a city in south-west Germany, the fifth-largest city in the State of Baden-rttemberg. During WWII, the city was almost completely spared from allied bombings. As a result, Heidelberg has retained its baroque charm of narrow streets, picturesque houses and of course the world-famous Schloss (castle ruins). 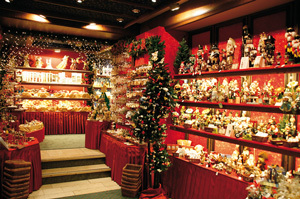 The Käthe Wohlfahrt Store is located at Hauptstrasse 124 at the corner of University Square. Rudesheim is a winemaking town in the Rhine Gorge and thereby part of the UNESCO (United Nations Educational, Scientific and Cultural Organization) World Heritage Site. Have you ever wondered what it would be like to step into a fairy tale with castles and rolling hills? Then a visit to Rudesheim is a must. The Käthe Wohlfahrt Store is located next to the cable car station by the Niederwald memorial at Oberstrasse 35. Miltenberg is a town in the Regierungsbezirk of Lower Franconia in Bavaria. Nurnberg located in the Bavarian state of Germany, and is Franconia's largest city. 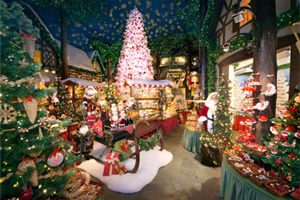 The Nurnberg Christmas Market features 200 market stalls presenting traditional wares, food and drink. The Käthe Wohlfahrt Store is located on Königstraße 8, a few steps from the Lorenkirche, (Lorenz Church). Oberammergau is located in the heart of the scenic Bavarian alpine region. This quaint town is noted for its murals on buildings and the production of a Passion Play every ten years. 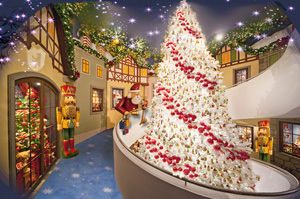 The two Käthe Wohlfahrt Stores are located at Dorfstrasse 6 and Dorfstrasse 25. Step inside the wonderful historic building which dates back to the 14th Century to find a world of surprises. The Käthe Wohlfahrt Store is located at Mulberry Hall, 17-19 Stonegate, YO16LQ York. Riquewihr is in Alsace, eastern France, on the Rhine River bordering with Germany. Riquewihr is a romantic little medieval city hidden between the Vosges Mountains and some of the most famous vineyards in Alsace. The Käthe Wohlfahrt Store is located at 1 rue du Cerf, opposite the Dolder tower. The two Käthe Wohlfahrt Stores are located at Walplein 12 and Breidelstraat 4.